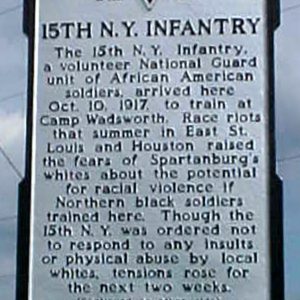 The 15th N.Y. Infantry, a volunteer National Guard unit of African American soldiers, arrived in Spartanburg Oct. 10, 1917, to train at Camp Wadsworth. Local whites feared racial violence like those of East St. Louis and Houston, and tensions rose for about two weeks. The War Department ordered the unit back to N.Y. on Oct. 24 and on to France. As the 369th U.S. Infantry, it joined the 4th French Army and its band won acclaim all over France for its concerts. 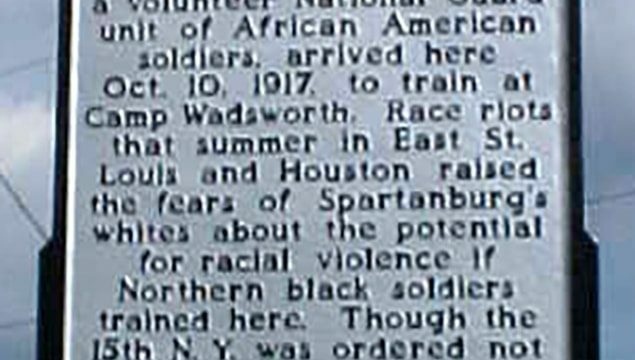 It was the first American unit in combat, and was soon nicknamed “the Harlem Hell Fighters.” It was at the front for 191 days, longest of any American unit in World War I.